 Zou Z Q, Zhang X H, Wang F, et al. A novel dual PI3Kalpha/mTOR inhibitor PI-103 with high antitumor activity in non-small cell lung cancer cells. Int J Mol Med, 2009, 24(1): 97-101. López‐Fauqued M, Gil R, Grueso J, et al. The dual PI3K/mTOR inhibitor PI‐103 promotes immunosuppression, in vivo tumor growth and increases survival of sorafenib-treated melanoma cells. International journal of cancer, 2010, 126(7): 1549-1561. 1. PI-103 sensitizes acute myeloid leukemia stem cells to daunorubicin-induced cytotoxicity. Med Oncol. 2013 Mar;30(1):395. doi: 10.1007/s12032-012-0395-5. Epub 2013 Jan 19. 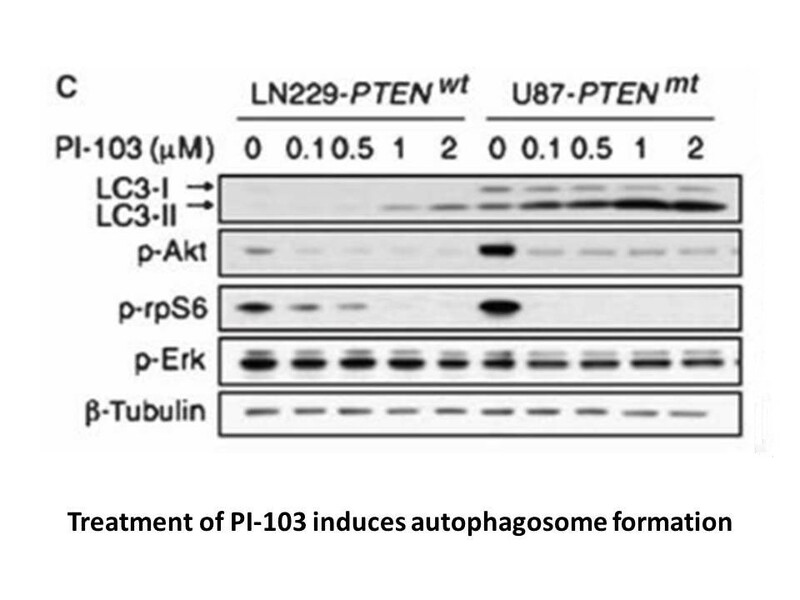 PI-103 is a PI3K/Akt/mTOR signaling pathway inhibitor that induces apoptosis in LSCs. The combination of PI-103 and DNR synergistically induces apoptosis in LSCs without affecting hematopoietic stem cells, where PI-103 sensitizes LSCs to DNR-induced cytotoxicity. 2. Chloroquine overcomes resistance of lung carcinoma cells to the dual PI3K/mTOR inhibitor PI103 by lysosome-mediated apoptosis. Anticancer Drugs. 2013 Jan;24(1):14-9. doi: 10.1097/CAD.0b013e32835a36db. The co-treatment of PI103, a PI3K/mTOR inhibitor, and CQ induces lysosome-mediated apoptosis in lung carcinoma cells, where PI103 increases lysosomal volume and function with its resistance reduced by CQ. 3. Arsenic disulfide synergizes with the phosphoinositide 3-kinase inhibitor PI-103 to eradicate acute myeloid leukemia stem cells by inducing differentiation. Carcinogenesis. 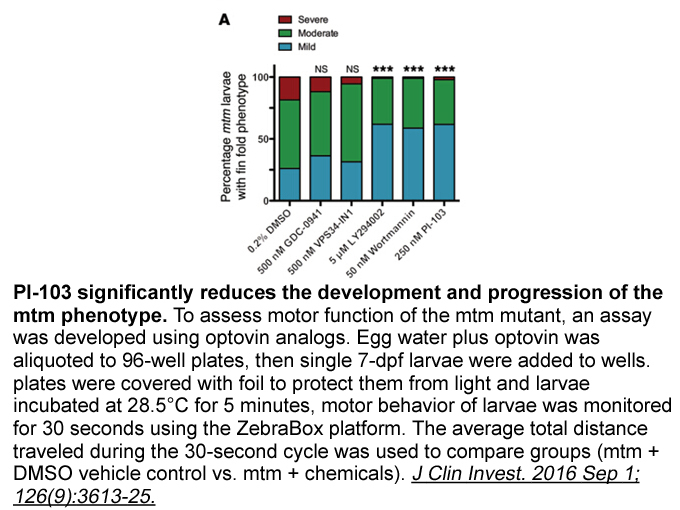 2011 Oct;32(10):1550-8. doi: 10.1093/carcin/bgr176. Epub 2011 Jul 29. 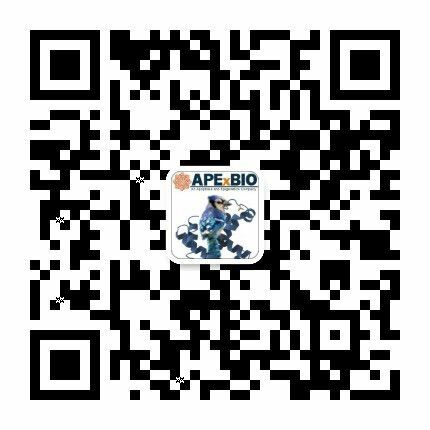 Propidium iodide-103 not only effectively inhibited PI3K/AKT/mTOR pathway activated by As(2)S(2) but also synergized with As(2)S(2) to eradicate non-APL LSCs, promote their differentiation and reduce their repopulation. 4. A dual PI3K/mTOR inhibitor, PI-103, cooperates with stem cell-delivered TRAIL in experimental glioma models. Cancer Res. 2011 Jan 1;71(1):154-63. doi: 10.1158/0008-5472.CAN-10-1601. Epub 2010 Nov 17. 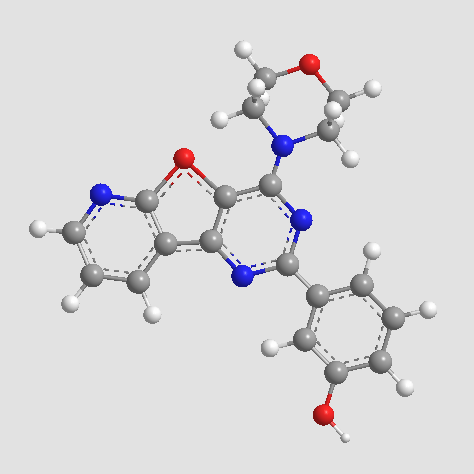 PI-103 is a PI3-kinase/mTOR inhibitor that exhibits anti-glioma activity through inhibiting tumor cell proliferation and invasion, arresting G(0)-G(1) phases of cell cycle and attenuating tumor growth. The combined therapy of PI-103 and S-TRAIL showed enhanced tumor volume reduction. 5. 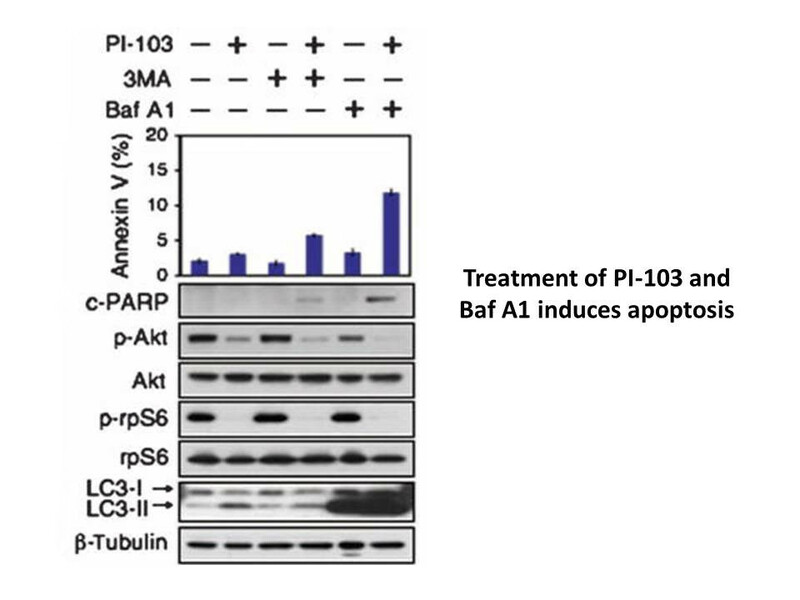 PI-103 and sorafenib inhibit hepatocellular carcinoma cell proliferation by blocking Ras/Raf/MAPK and PI3K/AKT/mTOR pathways. Anticancer Res. 2010 Dec;30(12):4951-8. The anti-proliferative activities of sorafenib, PI-103 and their combination in Huh7 have been demonstrated. Raynaud F I, Eccles S A, Patel S, et al. 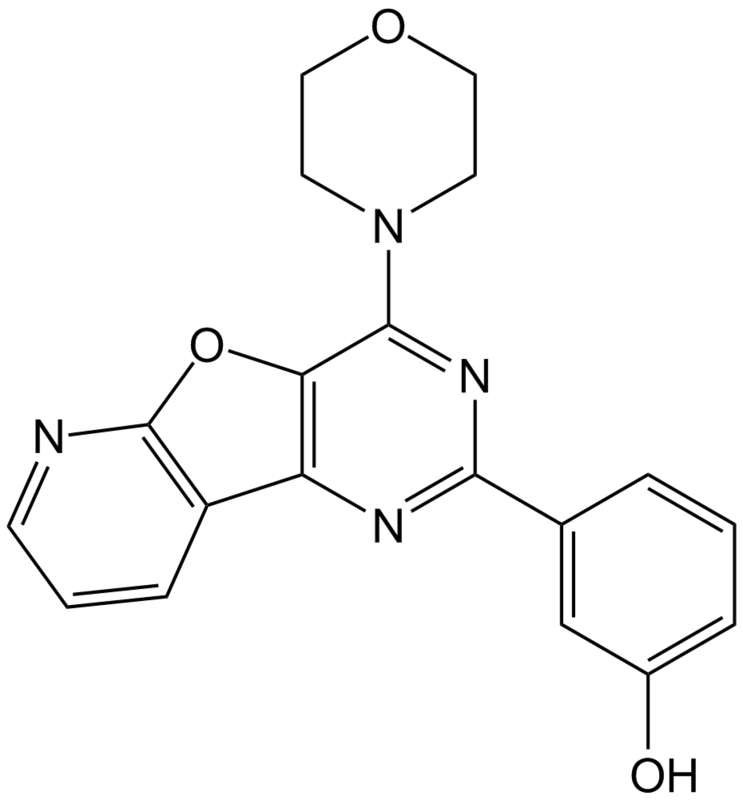 Biological properties of potent inhibitors of class I phosphatidylinositide 3-kinases: from PI-103 through PI-540, PI-620 to the oral agent GDC-0941. Molecular cancer therapeutics, 2009, 8(7): 1725-1738.